Relax, dear runner. Inflammation doesn’t have to be a gremlin. In fact, if you take care of it well and don’t feed it after midnight, inflammation can be a protective little guy who helps keep you running right. Okay, so maybe inflammation isn’t coming to get you. Maybe it’s just trying to tell you something. All runners experience inflammation. It’s our body’s natural response to any kind of trauma. And what is trauma to our body? All kinds of things, including a hard workout. You know you need to tear your muscles down so you can build them up again, right? Enter inflammation: it makes your muscles sore, tender, hot or swollen. These symptoms don’t necessarily signify disaster. Instead, think of them as a big yellow sign telling you to take it easy and recover, so your body can catch up with that fast brain of yours. But that’s not all! Inflammation is also a messenger, sending signals to your blood to get to work cleaning out the damaged tissue so proteins can come in and rebuild stronger muscle. To get faster, you need to get stronger. To get stronger, you need inflammation. You train hard, which makes little teeny-tiny tears in your muscles. Your muscles become inflamed, which releases white blood cells called neutrophils, macrophages, and monocytes (collectively you can think of them as the mogwai, the creatures that turn into the Gremlins in the movie), which eat away all the torn, broken bits of tissue. We’ll come back to that. You ingest protein (like these pancakes), which helps you build new, happier, stronger muscle. This is what inflammation does. So back to those mogwai, the white blood cells called the neutrophils, macrophages and monocytes. Gizmo will help me demonstrate how they react when your body has an inflammatory response. For the other science nerds out there, neutrophils are granulocytes (one of the types of white blood cells) that ride around in your blood stream waiting for inflammation. At the first sign of inflammation they speed in first, like a superhero dashing in to fight the bad guys. In fact, that’s their whole job, to be the first responders who spring into action with an arsenal of weaponry to either eat or kill bacteria! Man, check out that arsenal of weaponry! This guy’s ready to fight some infection! Unfortunately for the neutrophils, it’s a suicide mission. When the neutrophils are done with their job they die right where they are. And then guess what! They turn into pus. Mmmmm. But! Never fear! The monocytes are going to help with that. Monocytes (which are phagocytes, a different kind of white blood cell) float around in your blood stream too, but they’re more like the heavy artillery. When inflammation begins, and the neutrophyls are busy doing their thing, these guys hurry over and start some serious cell division to create an army of macrophages (which are, for our purposes, a subcategory of monocytes). What’s extra badass about monocytes is that while half are out in your blood stream, the other half live in your spleen waiting to be called up in case there’s something seriously wrong, and your body needs to call in the reserves! Monocytes + Inflammatory Response = LOTS of Macrophages! Once complete, this army of macrophages begins the real clean-up. Their job is to find a foreign substance and ATTACK! In this case, the foreign substance is the broken muscle tissue from our hard workouts, any remaining bacteria, and pus from the poor dead neutrophils. Macrophages come in guns-a-blazing, ready to gobble up foreign substances and clean the whole place out! Macrophages are gonna kick some foreign substance A$$! It’s all-natural, baby, and what’s good about your hard workouts causing minor inflammation is that these little guys get lots of practice. And practice, as we all know, is how they get better, stronger, and faster at what they do. Now that we understand what happens when inflammation begins, we can start to reconcile with it a little. The next step, after we ensure we recover to allow the mogwai (the neutrophils, monocytes and macrophages) do their work, is that we go run some more, so they can get more practice! But wait, there’s even more! Taking post-workout NSAIDs is like trapping your body’s good responses to inflammation in a cage! Don’t do it! Don’t Stop Inflammation! 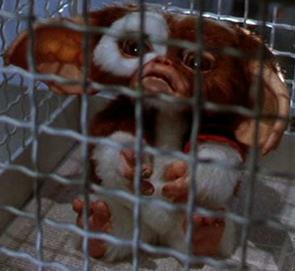 Keep Gizmo Free! NSAIDS are evil! Well, unless you actually need them. Do not interrupt the post-workout inflammation process with anti-inflammatory drugs, like ibuprofen or other NSAIDs. The latest studies show that NSAIDs like ibuprofen actually impede your body’s adaptation to your training (and the side-effects are suboptimal). We want your body to get stronger and faster from training, so quit the post-workout Advil, stat! If inflammation is causing good things to happen in my blood, what about these “natural” things we do in the name of aiding recovery? Ice slows down the blood flow, so is it preventing inflammation and the mogwai from doing their good work? Under normal circumstances, yes. Resist the temptation to do things that impede blood flow like ice baths after a hard workout. The science indeed suggests that slowing down blood flow will reduce the effectiveness of your body’s natural healing through this process. If you feel like you need an ice bath to recover in time for your next hard workout, you might actually need more time before your next hard workout to allow the mogwai to finish their work. What about compression socks or foam rolling? Even though compression socks are tight and feel like they’re impeding blood flow, compression socks actually increase blood flow. This is why compression is definitely a better option for post-run recovery than NSAIDs or ice. Similarly, foam rolling separates your muscle fibers and helps those mogwai get in there and clean out all the yucky stuff. These are good options if you want to do something to relieve the discomfort that comes from normal inflammation. But not all inflammation is normal. So here comes the hard part: knowing when to suffer through the pain and when to treat it. How does your pain rank? So you’re a little sore. Okay, it hurts but it’s tolerable. You may not like this, but provided the pain is minor (think yellow zone) and seems normal in relation to where you are with your training, it’s better for you to let your body do its thing and resist the temptation to do things that interfere with the process. You can try stretching or foam rolling it or wearing compression socks, if you want to do something about it. Yellow zone is usually just peachy, but once your pain starts venturing near the orange level, we need to rethink our love affair with inflammation. This infographic explains my theory that if you give inflammation NSAIDs, give it ice baths or feed it after midnight, it will turn on you and become a horrible pestilence upon your town! Er…body! Ignoring inflammation that causes even yellow-level pain that becomes chronic or systemic is tantamount to feeding your mogwai after midnight; it turns it into a gremlin, an angry beast that will stop at nothing until you pull out all the stops to rid your body of its pestilence! In short, seek help whenever your inflammation is no longer acute or local, especially if also causing orange or red-level pain. For example, in my case, when acute knee pain became chronic a few years back, when it was teetering between yellow and orange for weeks and weeks and weeks, it was time to seek medical attention. When localized inflammation became systemic, like when the pain that started in my knee began spreading down my calf and throughout the back of my hamstrings, causing me to nearly collapse at a race, it was time to seek medical attention. So, most of the time inflammation is our friend, helping us to become stronger faster runners if we let it. However, if we’re not careful, especially if we impede it’s process or don’t give the mogwai (white blood cells) time to do their job, inflammation can turn into a monster, a painful, horrible monster. How do you view inflammation? What’s your approach to NSAIDs, ice baths, etc? Great article — and accompanying illustrations! I always think about these issues when I’m tempted to take Advil or an ice bath and generally err on the side of not doing so unless I’m really hurting because I don’t want to be counterproductive. I am a big fan of post-workout compression and foam rolling. Glad to see I was on the right track! I will now think of these issues solely in terms of Gremlins. What about epsom salt bath? Heat generally increases blood flow, so a warm soak (with or without epsom salt) shouldn’t impede the normal inflammation process. This is the mental picture I’m going to go back to every time I evaluate my soreness level! I avoid NSAIDs but I use a herbal supplement that includes natural anti-inflammatories to encourage those little guys to work faster. I do also have recovery tights and compression socks, which are also nice if you’re traveling to a race since they increase blood flow! Ok this was seriously. As a non-sciencey person, I’m always struggling to understand the varied and often contradicting information about inflammation, workouts and muscle damage. So thank you thank you thank you! I’ll be pinning this to read again! *seriously useful – I got overly excited!